Oppressed minority groups have faced and addressed similar issues facing their communities in order to create long-term change. While seemingly effective for grassroots movements, the lack of unity facing the global spectrum has consistently caused minority groups to leave out certain groups because the movements have not been intersectional. While many movements have been proven to be successful within these groups, there is truth in the idea that there is power in numbers. If these groups can unify in the issues that they can so closely relate to, they can address these problems with a powerful front in a way that historically has not been seen. In this analysis we will address the similar issues that the Black and Latinx communities have and continue to face as oppressed minority groups, along with the importance of uniting as a single front to achieve what both groups have long been fighting for. A basic Fourth Amendment principle guarantees the security of “the right of the people” unless subjected to a warrant. Michelle Alexander explores this theory in The New Jim Crow by displaying the underlying foundation where, “it was generally understood that the police could not stop and search someone without a warrant unless there was probable cause to believe that the individual was engaged in criminal activity” (Alexander 63). She explores the transition of this theory in response to a Supreme Court ruling in 1968, known as Terry v. Ohio, shifting the right of security into what we know as the stop-and-frisk rule where “it is constitutionally permissible to stop, question, and frisk him or her– even in the absence of probable cause” (Alexander 63). The immediate transcendence of these rights instilled through the constitution and then through the Supreme Court allowed what is recognized as legalized discrimination, where the power is given to the police to make executive decisions based on their own insight on a said crime. 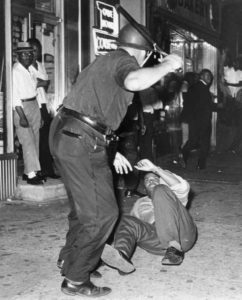 The results of these actions created a system of overt oppression, capitalizing on the ability to hinder marginalized groups, more specifically people of color, from progressing within society. Example: In New York City, whose demographics show an origin of over 70% white, the stop-and-frisk program seemingly works to disable to progression of minority groups by disproportionately racially profiling Black and Hispanic men. Historically the coalition between Blacks and Latinos has not been prominent. The Black Panther party created a platform that demanded the equality among all oppressed people, whereas the Brown Berets mainly focused on the Latino community. This led to a lack of communal effort among the two groups, thus making it harder to battle the oppressors and achieve their respective goals. 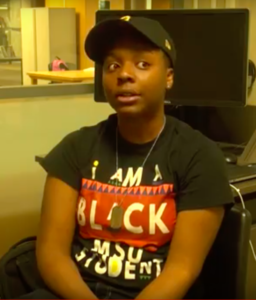 When looking specifically at the MSU’s history, the two communities have not always come together to battle the same issues. 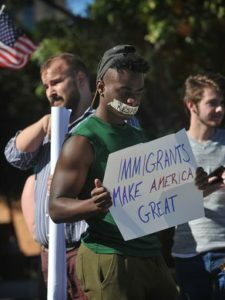 Each group demanded similar treatment and resources from the administration, but they did it at different times and without the full support of other communities. Police brutality against people of color is not a thing of the past. Even in 2017 we still see cases of police brutality against people of color. The latest incident that occurred was on February 23, 2017. The incident involved an off duty (white) male police officer and a group of teenagers, many of whom were Latino. The incident happened in Anaheim, California when a group of teenagers were walking home from school and they walked over the police officer’s lawn. The police officer cursed at girl and a boy stepped up to defend the girl and that’s where the police officer grabbed the 13-year-old boy by the collar. The police officer grabbed the boy without any valid reasoning. The case that happened back in December 8, 2014 the people who were involved were a (white) police office and this time a black male, Eric Garner. Eric Garner was confronted by a group of police officers that were trying to arrest him for selling illegal cigarettes. Eric Garner raised both hands as they police officers came to arrest him but told them not to touch him because he wanted to talk about the situation but the police officers grab him and put him on a chokehold and threw him to the ground. As this was going on he was yelling that he could not breathe but the police officers did not listen to Mr. Garner’s demands. This case did not end as well as the Anaheim one as this one ended up with Eric Garner dead on the ground. With both of these two cases the media played an important role with covering the news and getting both sides of the stories. The problem with the media however is that it never followed up with the stories so the audience never knows what happen to the story. As a group we decided that we would want to place our efforts into a solution that would impact where we are as students; here and now. Answering the question of: What can we do at MSU to address issues faced historically and currently by minorities in our community? While progress has been made as far as programs that are centered around Latinx Communities, or African American Communities, as well as other minority groups, there is a lack of intersectionality within these programs. This is important because of how similar and connected the issues that these communities face are. Similarly, the social movements historically and presently that have been created in the fight for equality have been successful because all of these groups are intertwined in some way. If we do not start educational programs that show just how these communities, the fight for freedom, and their issues are connected, it will be harder to understand in the present just how important coalition of these groups are. All too often these groups are spoken about separately, when in reality they are more closely intertwined than most people think. Education is a powerful tool; and a solid starting ground to bring together the Black and Latinx Community to both better understand, and better support each other. Lack of space means that there is simply lack of place to form a physical coalition of minority groups on camps. Currently the CLS off here at Michigan State University is a small corner in the building of Kedzie. This lack of space also means a lack of representation and a lack of space where minority groups can feel accepted. We are proposing the creation of a space where minority organizations and students can go to simply see and interact with each other. 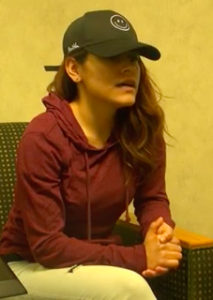 A space to show that there are people here that look like you, that share the same issues as you, and that want to create solutions to these issues. The idea is that this specific building would be able to hold all of the different minority/ethnic studies offices that we provide on campus. The building would include rooms where meetings can be held. This makes it easier to create a spaces for our on-campus organizations like BSA and CRU to have a space to not only easily come together, but also have a place to learn more about each other as a group and to work on a better university for minority students. After completing two interviews, one with a member of BSA and the other with one from CRU, we were provided with other proposed solutions from our own student body. Yamani of BSA makes an emphasis on support. As minorities on a campus whom as she said, share the commonality that “we’re not white”, we need to be there for each other. Any progression or change will start with this. This means showing up to each other events, listening to each others issues, learning about each others issues, and sharing our own issues with each other. If we are able to share this and learn this knowledge from each other, then we can support each other fully. Not only will we have a better understanding of each other separately, but also a better understanding of how we can work as a whole. While within this piece we specifically focus on only one act of injustice that is similar in both the Black and Latinx community, police brutality, the number of issues that can be relatable amongst both groups is a never-ending list. On only the simple the fact that both groups are oppressed minorities already sets us further apart from our white counterparts and closer to each other. Until we are able to realize just how much the success of one group relies on that of the support and work of the other, neither group will truly be able to get to a place where we are as “free” as our possibilities grants us. This takes a conscious effort from both sides, where each group is taking the time to teach the other side about issues happening within a belonged community allowing each group the opportunity to learn and empathize with the injustices taking place. Starting at grassroots movements like those we have on our campus, and influencing a wide scaled growth where instead of leading the movement alone, it is advanced through the strength and support from both oppressed groups of people. Alexander, Michelle. The New Jim Crow: Mass Incarceration in the Age of Colorblindness. New York: New, 2011. Print. Bloom, Deborah, and Jareen Imam. “New York Man Dies after Chokehold by Police.” CNN. Cable News Network, 08 Dec. 2014. Web. 19 Apr. 2017. “Brown Beret Ten-Point Program (1968).” Notes From Aztlan. 16 Apr. 2014. Web. 17 Apr. 2017. “Is Stop-and-Frisk Unconstitutional?” FactCheck.org. N.p., 29 Sept. 2016. Web. 18 Apr. Confrontation with Teens in Anaheim.” Los Angeles Times. Los Angeles Times, 28 Feb. 2017. Web. 19 Apr. 2017. Murdock, Riley. “A Boycott, Hunger Strike Forges Latino Studies Program at MSU in 1990s.” The State News. 18 Oct. 2016. Web. 19 Apr. 2017. Murdock, Riley. “BSA Storms Hannah Administration Building in 1989, Demanded MSU Attention to Minority Issue.” The State News. 18 Oct. 2016. Web. 18 Apr. 2017. Bureau. N.p., n.d. Web. 17 Apr. 2017. 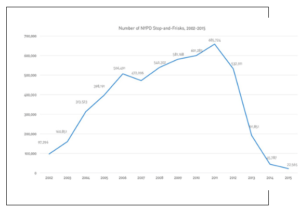 “Stop-and-Frisk Data.” New York Civil Liberties Union. N.p., 22 Feb. 2017. Web. 16 Apr. 2017. “The Black Panthers: Ten-Point Program.” Collective Liberation. Web. 17 Apr. 2017.